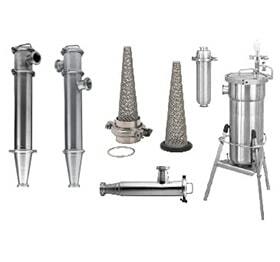 Alfa Laval offers two types of strainers, LKSF and LKVF LKSF has a wide range of applications within process filtering, especially where strainers of hygienic design are required. LKVF has a wide range of applications where removal of particles from a flow is required, eg. for protection of a pump or other sensible equipment. LKIF is a sanitary in-line filter for use in dairies, breweries and other food industries as well as in the pharmaceutical and other light chemical industries. LKIF is designed for filtering particles from the products, e.g. for protection of pumps and other sensitive equipment. LKSF has a wide range of applications within process filtering, especially where strainers of hygienic design are required. LKVF has a wide range of applications where removal of particles from a flow is required, eg. for protection of a pump or other sensible equipment. Available in long and short models, Mainstream® filters and strainers with side-entry ports provide versatile, cost-effective, basket-style filtration. Designed for maximum application flexibility, the Mainstream housing accepts a wide range of filtration and strainer media. For strainer applications, the unit can be fitted with a variety of different baskets. When used as a filter, the Mainstream® unit incorporates a perforated stainless steel basket designed to hold disposable filter bags. Fine filtration can be achieved down to 0.5 micron. They are ideal for use in the dairy, food, beverage, meat and poultry, cosmetics, and pharmaceutical industries. Available in long and short models, Streamline® filters and strainers provide versatile, cost-effective filtration. Designed for maximum application flexibility, the Streamline housing accepts a wide range of disposable filter and reusable strainer media. They are ideal for use in the dairy, food, beverage, meat and poultry, cosmetics, and pharmaceutical industries.